DBMD INTERVIEW DATE FOR 2019 – MAY 17-18 – SAVE THE DATE! Talk to your local pastor and get approval from your Local Board of Administration. Your pastor should then send a recommendation letter to the District Office. Register with the Wesleyan Headquarters Education and Ministry as a ministerial student. Begin the process with your local District Board of Ministerial Development (DBMD). Begin your studies by enrolling in a Wesleyan University or FLAME classes. You can also enroll in District Extension classes as they are offered. This chart explains the Wesleyan Church procedure. Please note that there may be additional district requirements. 2. Educate yourself on the process of becoming a minister in the Wesleyan Church and becoming a minister/accountability in the Wesleyan Church. 3. Please check our current academic requirements to get an idea of all the classes you may need to take. This page provides you all the forms you need to submit to us. 1. The following 3 forms will have to be completed by your references and mailed to the district office. Local_Pastor_LBA_Initial_Recommendation_Form – This form should be completed by your local pastor. It states that your local church recommends you as a ministerial student. Note: This form should be submitted at the beginning of the process. If you have not submitted this, please do so along with your first-year forms before attending your first DBMD interview. DBMD #2 Initial Reference – You MUST have at least 3 of these forms filled by different references. Note: To streamline the process you can distribute the forms to your references, along with a stamped envelope addressed to the district office. Forms can also be e-mailed to office@southcoastal.org or faxed to 770-922-9331. Please follow up to ensure we receive the forms in a timely manner. 2. Please submit your picture with your first-year forms. 3. 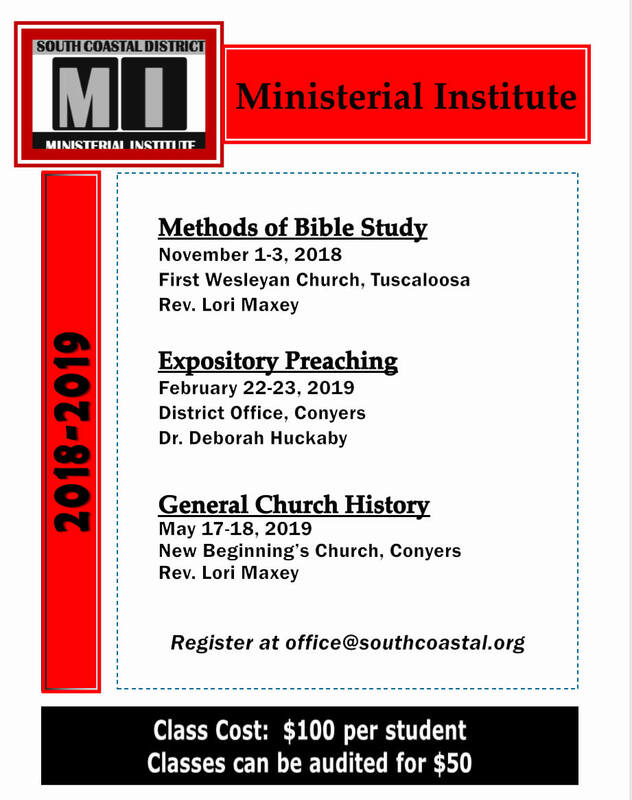 Please provide a copy of your “Ministerial Preparation Online Enrollment” form that you will receive when you register as a ministerial student at the Department of Education and the Ministry of Wesleyan World Headquarters. 1. DBMD #3 – This form is required to be completed every subsequent Year. 2. Local Pastor Annual Recommendation Form – Complete this form if you are serving in a local church as a staff pastor or lay person. 3. Annual Recommendation Form from Vice Chairman or LBA Secretary – Complete this form if you are serving as a Senior Pastor, Solo Pastor or Supply Pastor. 1. Super 7: Supervised Ministry – South Coastal District – Please download the Super 7 file and contact your DBMD Director for further instructions. Note: If you have not received credit on your transcripts for Supervised Ministry, you will need to fulfill that on the district level. 2. DBMD #4 Reference for Ordination – You MUST have at least 3 of these forms filled by different references. In addition, the District Superintendent will also need to fill out one of these forms. Note: To streamline the process you can distribute the forms to your references, along with a stamped envelope addressed to the district office. Forms can also be e-mailed to office@southcoastal.org or faxed to 770-922-9331. Please follow up to ensure we receive the forms in a timely manner. 3. DBMD #5 Ordination Application – Please submit this form along with the other ordination forms. 4. There is also a counseling requirement that must be fulfilled. You are required to meet with a Christian counselor and be assessed for emotional and psychological stability. The counselor must then submit a letter to the DBMD stating that you are emotionally balanced, and there are no mental health issues hindering you from proceeding into full-time Christian ministry. The district will pay for this appointment. If you have questions regarding this requirement, contact the District Office directly. These following forms are only needed if you are requesting your ordination credentials to be transferred to the South Coastal District from another denomination. All incoming pastors are required to undergo a Criminal Background check. This has a fee of $25 that is payable to South Coastal District. You will receive an email requesting that you fill out the application from Ministry Mobilizer. Please submit that form and send a check to the district. We are excited that there are so many educational opportunities for our students that are not enrolled in university and seminary. With all of these options available, it is essential and mandatory that each student complete 2 courses per year. PLEASE REMEMBER THAT NOT TAKING 2 COURSES PER YEAR COULD JEOPARDIZE YOUR MINISTERIAL CREDENTIALS. We have worked very hard to make sure there are multiple options to fit your schedule. Not only are these classes being offered – there are also scholarships available for all of the above options for those students who qualify. There are still some opportunities available before DBMD, check out the schedules and make the most of the opportunities available to you. Ministerial Institute: Classes offered every year around the district and via Zoom. See schedule below. Participate in FLAME: This includes 3-5 day courses that are held around the country and online. (https://secure.wesleyan.org/71/flame). There is pre-work and post-work for each class, so each one takes about 6-8 weeks to complete. Enroll in correspondence courses: Education and Clergy Development offers all of the courses required for ordination through correspondence courses as well (http://www.wesleyan.org/correspondence). For these courses, you have 6 months to complete the work, and you do not have to travel. However, you are on your own, without the community of other students. Enroll in Cross Training through Oklahoma Wesleyan University (http://www.okwu.edu/online/program/crosstraining/): OKWU offers online classes that are three weeks long, online, which meet the ordination requirements of The Wesleyan Church. These are much more intensive than correspondence courses, but many students enjoy learning with a cohort of others who are pursuing similar goals.